You can tell accomplished ballroom dancers by their beautiful upper carriage. How many times have you said to your students, “Put Your Shoulders Down”? A sure fire way to recognize an accomplished dancer is by looking at their upper carriage. Even with their arms up in a frame, good dancers’ shoulders are relaxed and down, their necks are long and their sternums are lifted. You know a beautiful upper carriage when you see it. The question is: how can YOU get there, and how do you teach your students to do this in a way they will remember, understand and integrate so that they don’t need constant reminders from you? Unfortunately, one of the most frequent admonitions used by dance teachers, “Put your shoulders down”, doesn’t cut it. Students usually respond by pressing down at the tops of their shoulders which results in tension in their necks and a stiff, rigid look to their frames. There’s got to be a better way! 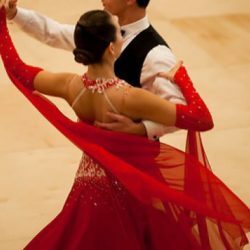 Purpose: To position the shoulder blades so as to improve frame, partner connection and top line, and to create width and stability. Position: Standing with a partner. Look at yourself in a mirror and take a mental snapshot of the appearance of your neck, shoulders and upper chest. Then have a partner stand behind you and place his or her palms on your shoulder blades. Throughout this exercise, your partner will softly assist the movement of your shoulder blades with his or her palms. Gently slide your shoulder blades up toward your ears. Then slide them down toward your waist (without power). Together with your partner, slide your shoulder blades away from your spine (i.e., spreading them wide toward the sides of the ribcage). Then slide your shoulder blades toward your spine (i.e., bringing them closer to each other). Switch roles with your partner and repeat steps 2-3. Again, have your partner stand behind you and place his or her palms on your shoulder blades. Anchoring the shoulder blades uses two of the four directions you have explored—down and away from the spine. Together with your partner, move your shoulder blades down and away from the spine. Complete the anchoring of your shoulder blades by tipping the bottom point of each shoulder blade toward the front of the body (i.e., inward, toward the front of the ribs). Have your partner gently press the points of your shoulder blades forward using the heels of his or her hands. Sense the corresponding feeling in your chest of slightly lifting and opening. Ask your partner to slowly release his or her hands while you maintain the anchored position of your shoulder blades. Now look in the mirror again and notice the difference in how your neck, shoulders and upper chest look. Switch roles with your partner and repeat steps 5-7. Having experienced anchored shoulder blades, you can re-establish them without repeating this whole exercise. Is there another lesson to be learned here besides knowing how to “keep your shoulders down”? Yes—it takes a deep understanding of the body to develop into a beautiful dancer. In my experience, learning how the body moves has been a fascinating and pleasurable process, and has produced amazing changes in my dancing and teaching. In my dancing, it has allowed me to have greater control over my body and to dance actions easily and effortlessly. And it has given me better ways to teach that are easy for my students to understand. How did Anchors Away work for you? Share your experience in the comments—or tell us your favorite tip or exercise for keeping the shoulders down.